How do you tackle this man’s RCA ? 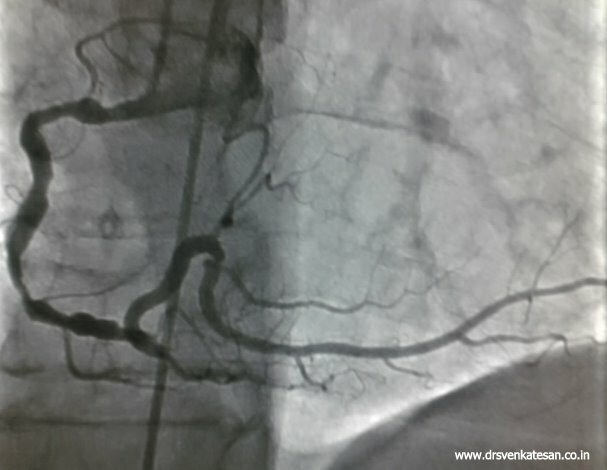 This is an RCA of a patient who had chronic stable angina , class 2 with moderate anti anginal medication. Without knowing the status LAD and LCX . . . RCA should not be touched . Further, the concept of tackling the coronary artery by itself is fundamentally wrong ! We are supposed to tackle patient’s symptom , reduce future risk of events and not merely their coronary artey ! His LAD and LCX was near normal. In the weekly cath meet PCI to mid RCA covering the critical segment was strongly debated but lost a close race . The final decision was to allow the patient to continue intensified medical management (Statin 80mg /Metoprolol 100mg ) . He is comfortable with that . Medical management in a tight single vessel disease can never be digested by any Interventional cardiologist whatever may be the guidelines ! Sinus node which orchestrtes the rhythm of life gets it’s blood supply by a small blood vessel arising from either RCA or LCX. (55 :45%) . The course of sinus node branch is highly variable . There are three distinct pattern observed. * Some refer to as clockwise and counterclockwise course. SA node is a spindle shaped structure with a length up to 20mm . Extending from cranial to caudal aspect.The pecularity of the blood supply to SA nodal artery is , it enters the SA node either in it’s superior aspect or inferior aspect never in the mid part. There can be water shed area in the either ends depeding upon the entry.This can have electrophysiological and pathological significance . The other consistent feature is that , the major trunk of SA node artery courses through the central core of SA node.In fact , many times pathologists recognise ther SA node , with the help of this arterial course. Is there a collateral blood supply to SA node ? It is not common . Rarely atrial branches of LCX /RCA can have extensive anastomosis with SA nodal branches .The hemodynamic significance of which is not known. Ischemic SA nodal disease has become an important entity . As the cardiologists are preoccupied with opening occluded coronary arteries in cath labs , it is not surprising to note, there is little ongoing research in the anatomy and physiology of SA nodal blood supply. At this point of time , we should realise the 1ooth anniversary of SA nodediscovery passed of silently . Kieth and Flack found the SA node with bare eyes in the year 1907 , when none of the present-day investigations including ECG and X RAY were not even conceptualised ! Related point : How do you recognise the SA nodal artery in coronary angiogram ? 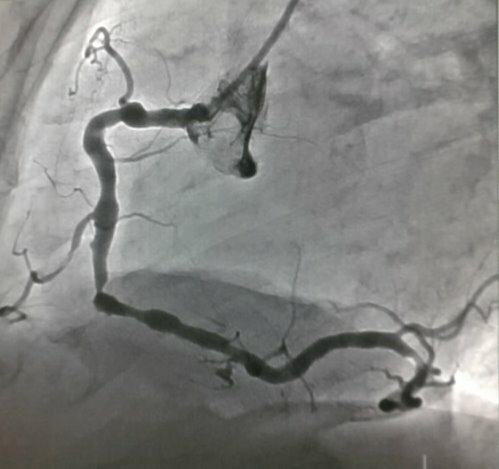 During RCA angiogram it is many times confusing to identify the SA nodal branch . In RAO and LAO views the plane of exit of SA nodal branch from RCA will be determined by the course it is going to take . (Anterior vs posterior encircling pattern). The conal branch which is often the first branch of RCA , also behaves aberrantly many times. So, we can’t have a rule of thumb in identifying SA nodal branch . When SA node branch originates from LCX it has to take a long route but once it reaches the SVC/RA junction it takes one of the above described course. It is not clear whether LCX fully understands it’s responsibility , when RCA ignores it 45 % of times . There is reason to suspect the commitment and dedication of LCX because it rarely supply the SA node by a seperate branch. It is often the left atrial CX that comes to the rescue and give a twig to the SA node . Considering the complexity of SA nodal blood supply , one can understand why some develop premature sinus node failure. One can never determine with evidence , how much of SA node destruction is due to ischemia and how much is due to age related degeneration and fibrosis. How common is persistent ST elevation in inferior leads following STEMI ? Persistent ST elevation is the general technical term for failed thrombolysis.Regression of 50% of admission ST elevation is the required criteria for susccesful thrombolysis . Thrmobolysis fails in about 40-50% . If we take 100 patients with persistent ST elavation 90-95 will be in anterior LAD territory . Read the following link for answer to the title question . Beware of beating heart CABG : It is minimally invasive and minimally effective ! The NEJM’s breaks the hidden truths about cardiopulmonary bypass in a beating heart. The irony in medical science is , trend setting land mark articles usually arrive very late . . . to disappoint all those patients who got the wrong treatment ! Off pump by pass is definitely one among them . . . The surgeon’s conflict in defining what is successful CABG .The success of CABG is in relief of symptoms & providing good bypass graft with long term patency .It is not in less thoracic trauma or in a quick hospital discharge ! What is the mechanism of complete AV block in inferior MI ? Conduction disturbance is a fairly common occurrence following MI. Inferior STEMI is especially prone for AV blocks. This is because the blood supply to AV nodal tissues and the inferoposterior surface of the heart share the same arterial territory . AV node gets it supply 90% of time by right coronary artery(RCA ) and 10% by LCX. Very rarely from both . The inferior aspect of the heart has rich innervation of vagal nerve terminals (While the sympathetic adrenergic system is concentrated in the anterior surface) . The moment infero posterior MI occur it stimualtes the vagus and a prompt bradycardic response occur .Many times the classical hypotension /bradycardia reaction is simply a reflection of heightened vagal tone. As expected, vagal stimulation can result in a spectrum of arrhythmias from the simple bradycardia to complete SA block to AV block. Extreme bradycardia , may release the junctional pace maker and result in junctional rhythm with a rate of around 40-50. There can be a functional AV dissociation between SA node and AV node. Careful ECG analysis is required here , as it can mimic organic AV block.The simple way to differentiate between organic AV block from simple AV dissociation is to look at the p waves.In AV dissociation both atrial rate and ventricular rate are nearly equal or VR is slightly more than AR .In CHB atrial rate exceeds ventricular rate. Ischemic AV nodal arrhythmias are some times very difficult to differentiate from vagotonia especially if occur within 24h. * Some time a an episode of sudden severe bradycardia can be manifestation of RCA reperfusion.Flushing of SA nodal or AV nodal branch of RCA might trigger this. This has a potential to bring the heart to asystole.The resultant extreme bradycardia often triggers VT/VF .The reported high incidence of primary VF in infero posterior MI is attributed to this sudden RCA perfusion. Brady arrhythmia’s due to high vagal tone are generally benign .No specific intervention is required.Atropine will be suffice in most situations.Some times isoprenaline may be required. Aminophyline , now Ivabradine may have a role. Atropine not only corrects the HR it raises the BP also as it counters both cardioinhibitory and vasodepressive limbs of vagal stimulus mediated by acetyl choline . Pacing for Bradycardias in inferior MI. Generally not necessary for sinus bradycardia. Weaning of temporary pacing in inferior MI. How many will require permanent pacing following infero posterior MI ? Only a fraction of patients with CHB require long term pacing . There are some centres tend to overuse PPM in this situation. Wait and watch policy may be the best.A unnecessary lead within a infarcted ventricle has a potential to create problems .There have been occasions a stable RV MI has been destabilised due to RV pacing lead triggered recurrent VF. It is relatively uncommon.Atrial involvement is more common with infero posterior MI and hence a greater incidence of atrial fibrillation .